Phil Ivey has very quickly become one of the top poker players in the world. He has racked up 10 WSOP gold bracelets since jumping into the poker fire and has many final table finishes including nine in WPT events. His poker exploits have earned him the title of the “Tiger Woods of Poker.” His style at the table is calm and cool rarely getting over emotional. He doesn’t talk much to the other players and remains incredibly focused seemingly to take in everything…while his opponents may rant, rave or even cry while slowly withering away. He always conducts himself as a professional and this has earned him great respect at the tables amongst his peers. 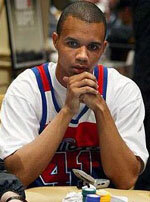 Born in 1976, in California, Phil Ivey actually grew up in New Jersey. He honed his poker skills in Atlantic City where he used a fake ID to get into the casinos as a teenager. With five or six years of fairly competitive poker under his belt, in 2000, he won his first World Series of Poker gold bracelet at age 23 for Pot Limit Omaha, taking away $195,000. While he’s most known for his No-Limit playing ability, he’s also a very good Seven Card Stud player. In fact, he won the 2002 WSOP Seven Card Stud event and made it to the final table in 2003. His successes at the tables continue to mount. In 2005, in Monte Carlo, he won two tournaments within 24 hour of each other for a total of $1.6 where the final table of the second tournament consisted of John Juanda, David Ulliot, Chris Ferguson, Mike Matusow, Phil Hellmuth and Gus Hansen. And at the 2006 WSOP he took home about $850k in prize money over a two week period. He came into the '09 WSOP amidst furious rumors regarding his prop betting prowess, and then presumably won a fair amount of his side action by taking down the $2500 2-7 Lowball event for $96,367. Just over a week later, he sent Vegas into a frenzy after claiming his second bracelet of the series, this time dismantling the field in the $2500 Omaha/Seven Card Stud Hi/Lo to the tune of $220,358. As if that wasn't enough, Ivey capped off his remarkable run by cementing his place at the Main Event final table as one of the "November Nine." Regardless of the final outcome, the 2009 World Series of Poker will always be remember as the year of Phil Ivey. In 2017 he was elected into the Poker Hall of Fame and has total live tournament winnings that exceed $26 million. He is currently ranked 7th on the all-time live tournament list. In 2014, won $1,500 Eight Game Mix WSOP event. In 2013A, won A$2,200 Mixed Event WSOP event. In 2010, won $3,000 H.O.R.S.E. WSOP event. In 2009, qualified as one of the "November Nine." In 2009, won the $2500 Omaha/Seven Card Stud Hi/Lo WSOP event. In 2009, won the $2500 2-7 Lowball WSOP event. In 2008, won the WPT L.A. Poker Classic for $1.5 million. In 2006, at the WSOP, Phil Ivey won a total of nearly $850k over a two week span! In 2005, won the Monte Carlo Millions tournament taking home $1 million! In 2003, finished second in the World Poker Open. In 2003, made the final table at the World Series of Poker Main Event. In 2002, took home three gold bracelets, tying Phil Hellmuth and Ted Forrest for the most wins in a single year. In 2000, won the Pot Limit Omaha WSOP title.